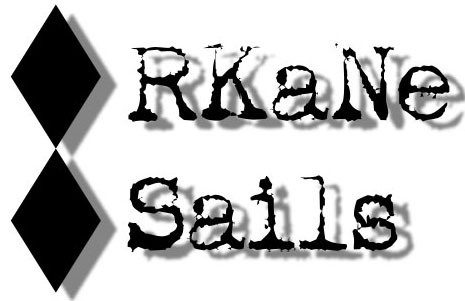 RKaNe (pronouced "arcane") sails are designed, built, tested, destroyed, and repaired by us (Roger and Kathy Nightingale). We've set up this page to share our designs, and to hopefully encourage open exchange of designs and construction techniques. Pictured below is the first sail we ever made. It's a 4.5 and the photos were taken before any modifications. It has since been reluffed twice and the clew has been repaired - now it's a 4.4 - or maybe a 4.3 - we're not sure. Windows media of the thrice reluffed 4.4 at Core Banks. RKaNe 4.0 (PDF) - On the table . . .
PDF files for planforms are available above. The luff curve for the 5.0 is also provided. This curve works very well and has good range (i.e. it won't be a dog if you build it). It is not as loose in the leech as most modern sails, but we like it that way. We reluffed the 4.5 using the same curve, but it needs a little tweaking. We are scaling the 5.0 curve for different sail sizes based on luff length and boom length. Right now, we are not posting any panel or patch details - so far, they have varied from sail to sail. Same goes for the seam shaping. Our sails have just 3 panels. The luff panel runs from the leading edge of the top batten down to the foot (6 inches from the tack). The foot panel is everything below the foot batten and and it overlaps the luff panel (although we are experimenting with a non-overlapping panel on the 5.5). Both the foot seam and the luff seam have shape. The body panel is a single piece of 4 mil X-Ply that runs from the foot the the head. The luff curve offsets are referenced against a chord running from the head of the sail to the tack. The tack is the reference point for all designs, and the chord is the reference line. Batten Tensioners: Windwing Designs Inc. Tack Fitting: Windwing Designs Inc.
Don Ketterrer - For the bulk of what we know about luff curves, seam shaping, materials, construction techniques, and sewing machine maintainence and repair, and for being a good friend. Jesse Venable - For all the "Rules of Thumb", and for being so stoked. Bill Hansen - "You've opened a can of worms which could ruin your career and take a lifetime to rectify."